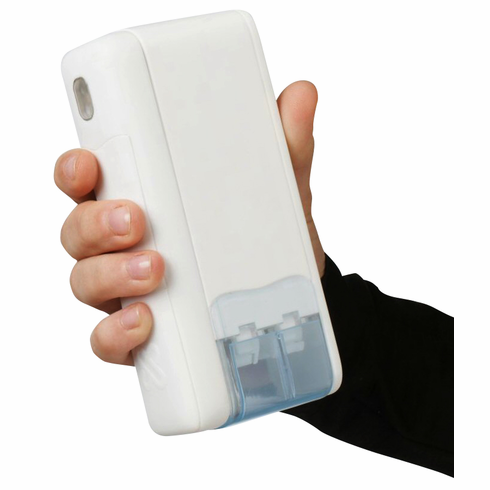 Complete e-pill portable medication management system (PD1) that fits in your hand. Dispense one (1) or two (2) medications up to 15 times per day. Keeps track of each individual pills. Alarms by sound, vibration, and light. Compact form-factor allows this e-pill portable automatic pill dispenser to go with the patient; use at work, school, travel and when you just leave the house. Never forget to take medications again with this e-pill Automatic Pill Dispenser | Also available as a Bluetooth Medication Dispenser (e-pill medimi Bluetooth). Easy to Use Portable Automatic Pill Dispenser. Load your tablets, caplets or capsules ahead of time in one or two Cartridges. If you need to administer one type of medication you can "chain the cartridges" and double your capacity. e-pill medimi Portable Automatic Pill Dispenser. Keeps track of 1 or 2 Medications. Easy to Program: Schedule your pills (time of day, number of pills, Cartridge 1 or 2) up to 15 times per day. Your e-pill medimi keeps track of # of doses left and when you took your medications. You may also schedule an "early dose" window if the patient is allowed to take medications ahead of time. Time to take your pill: Your e-pill medimi starts to Blink, Vibrate and/or Beep. Simply press the BIG outside button once to silence the alarm and a second time to dispense (get the pill(s) out). Multiple pills (from one cassette or both) can be given at the same time. Your e-pill medimi system contains; 1 medimi Basic, 4 Cartridges (2x15 and 2x7), Manual and Batteries (2 x AAA). One Pill Per Slot: Smaller pills fit in the 15 x Chamber Cartridge and larger pills go in the 7 x Chamber Cartridge. A total of four (4) Cartridges are included with your e-pill medimi basic system (see below). Please note that only two (2) Cartridges can be active at any one time with the e-pill medimi BASIC configuration (as sold here). Pill Capacity: Up to 15 medication events (smaller pills using 2 x 15 Cartridges with one (1) pill per event) or 14 medication events (larger pills using 2 x 7 Cartridges with one (1) pill per event. Warranty: One (1) Year Warranty by Manufacturer MedicPen AB. 30-DAY Money Back Guarantee. Device is Made In Sweden and sold in the USA/Canada as e-pill medimi. Shipping: FREE Standard Shipping (US only, Non-US customers pay $15.00 S&H).